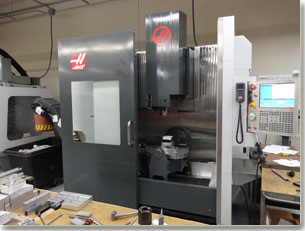 Our 4 000 square foot multitasking cnc machine shop located in San Jose features an arsenal of precision equipment (such as 5 axis Haas) to tackle the high volume Milling and Turning parts. We specialize in quick turn custom precision machining and prototyping at competitive price. At AC you get your parts fast and you get them right.Combine our years of 5 axis cnc machining expertise in machining and prototyping with state of the art equipment and cutting edge software (SolidWorks and Autodesk Inventor) and the result is AC's finely tuned manufacturing shop solution right here in the heart of Silicon Valley. we are very competitive when it comes to manufacturing large quantities. 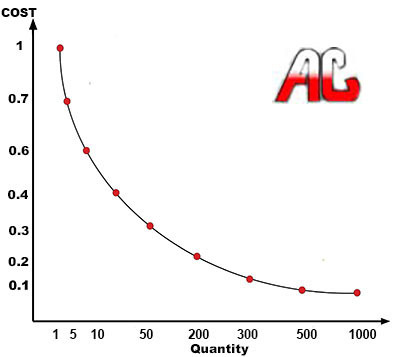 Have a look at the graph to see how the manufacturing costs can be decrease with high volumes. Request a quote to find out how we can beat your producion machining prices. 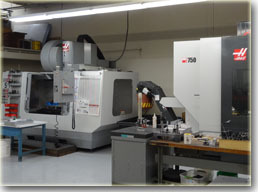 AC Machining has many types of cnc equipment for manufacturing your parts. Our 5 axis Haas machines can hold tight tolerances on large production runs or single prototype pieces. We have five axis vertical centers that can turn, mill, bore, thread, groove, drill your machined parts. CNC Milling or CNC Turning is what we do best. To see some pictures of work and prototypes we have done in our shop, check out our cnc machining showcase . This will give you an idea of the quality and precision you could expect from AC. 5 AXIS machining changes the world. We want to be on the frontline to do the most difficult custom precision 5 axis jobs for your business. We cut all materials like aluminum, brass, stainless steels, copper and plastics (eg. ceramic peek) and more difficult to machine materials like titanium, kovar, invar, hastelloy, molybdenum as well as tungsten and other exotic metals with extreme precision using CAD/CAM software (Solidworks, Autodesk Inventor) as well as other newest cnc machine industry tools and equipment. AC Manufacturing's challenge is to produce the most difficult to make prototypes. Whether your prototype is a lead to production runs, a stand-alone piece, or a fixture, we are here to deal with it. San Francisco, Palo Alto, San Diego, Los Angeles, Orange County, Seattle or Portland, your location does not matter for us. Our extensive experience in cnc machining allows you to consult on your design and look at various options in materials, finishes and machining operations � all while keeping costs down. AC Manufacturing is a premier choice for cnc machine shop in Bay Area, California servicing local industries in surrounding San Francisco, Oakland, San Jose, Redwood City, Palo Alto, San Mateo, Berkley, San Rafael as well as in Southern California: San Diego, Los Angeles and distant customers in Seattle, Portland, New York, Texas, North Carolina and across the USA. We provide precision CNC machining for industries like: Medical, Biotech, Electronics, Aerospace, Aircraft, and Semiconductor. 5 Axis cnc machining is unique in its ability to effectively process part sizes and shapes with essentially infinite possibilities. 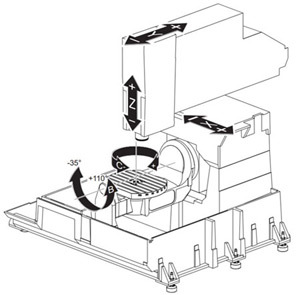 Like 3 axis machines, the cutting tool of a 5-axis precision machining center moves across the X, Y, and Z linear axes, but also rotates on the A and B axes � allowing the cutting tool to approach components from any direction. Curves are as easy to cut as straight lines, complex 3-D structures are relatively easy to produce, and the number of steps that required human action have been dramatically reduced thus saving time in money in cnc shop. With the increased automation of manufacturing processes with precision 5 axis CNC machining, considerable improvements in consistency and quality have been achieved in modern machine shops to deal with the most sophisticated prototypes. 5 Axis Machining demands a machinist to think out the box. It might be difficult to apply cnc machining into true 5 axis motion but we do exactly that! The UMC-750�s dual-axis trunnion table can position parts to nearly any angle for 5-axis (3+2) machining, or provide full simultaneous 5-axis motion for contouring and complex cnc machining. The trunnion provides +110 and -35 degrees of tilt and 360 degrees of rotation for excellent tool clearance and large part capacity, and the 630 x 500 mm table features standard T-slots and a precision pilot bore for fixturing. For more details visit Haas Automation. We use many different metals such as hastelloy that possesses excellent mechanical strength, especially at high temperatures, and is both highly resistant to corrosion and oxidation. Brass has good corrosion resistance and is resistant to most chemicals. 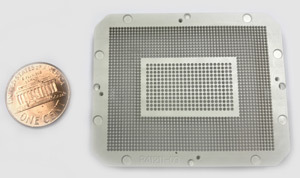 Molybdenum has the low thermal expansion, similar to that of silicon, makes it a frequently used material in the electronics industry for semiconductor supports and glass sealing. On the other hand, tungsten has the highest melting point and the highest tensile strength. It is extremely durable. Pure tungsten is too difficult to work with, so tungsten that is used for industrial applications - and in jewelry - is compounded into its carbide form. 5 axis machining is used in wide range of industries to manufacture components and prototyping with ultra-precision and fast manufacturing times: Satellites, Aircraft, Aerospace, Optical and Medical Equipment. The Machinist Calc Pro 2 machining calculator includes materials and tool settings combined with DOC and WOC to solve all your speed and feed calculations for face, end or slot milling plus turning, drilling and boring. If you change from an Android device to an iPhone or iPad, you WILL need to buy a new license as they are incompatible. This is the go to app to troubleshoot issues in your CNC Machines, PLC or Robots with FANUC Drives. Do you know that it costs an average of $5,000 for a service engineer to walk into your facility? Using this knowledge base, even a person with minimal CNC troubleshooting experience can troubleshoot on his own without waiting for a service engineer. The step by step flowcharts included in this app will walk you through to troubleshoot your problem with 3 or 5 axis cnc machine. All you have to do is answer YES or NO. Sometimes buying two parts is cheaper and faster than getting a CNC engineer to visit your machine shop. There are alarm and symptom approaches to troubleshooting and procedures on maintenance and safety. A link to this app. Modern Machine Shop Online - Online solution database, engineering books, e-books and more useful for machine shops. CNC Report Machining - Editorials and news about metalworking and cnc machining.